Some homilies, scattered thoughts, images from the Passionists: : whatever the days bring. Follow me on Twitter @vhoagland. This entry was posted in Religion on November 28, 2017 by vhoagland. The brighter the light the more we squint. The closer we get the less we see. And if we stare we go blind. In total darkness the answer is clear. No need to go too slow. My Son is “the way and the truth and the life”. In Him you never fall. You may not see Him but He is there. It is a tight walk. That’s why I gave Him a pole. I gave you one too. And because it can get very dark. I made them easy to identify. They are made of thick dead wood. Your hands know their splinters and knots. Kiss in the dark what you cannot see. For that old piece of wood. Will get you across the gorge. Where on the other side. Grafted into the Tree of Life. If you enjoyed this post, please consider “liking” it, adding a comment, becoming an email subscriber, or passing it along via the social-media links below. Your support is greatly appreciated. Step by step. All for God’s glory. This entry was posted in art, contemplation, Inspiration, Motivational, philosophy, poetry, Religion, spirituality and tagged beauty, Catholic, Christ, Christian, Christianity, faith, God, hope, Howard Hain, Jesus, joy, life, love, peace, perseverance, poetry, prayer, silence, trust, truth on November 28, 2017 by vhoagland. This entry was posted in Religion on November 25, 2017 by vhoagland. What if someone handed you a child? A few hours…a few minutes old. What if you were the only one that the child could be handed to? No one else around to help. Would you receive that child into your arms? There’s no sterilized room, no sanitary precautions, no sink, not even a bar of soap—just plain old you, a bunch of imperfect circumstances, and a poor tiny child that needs to be embraced. You know what you would do. Even if your hands were filthy, completely covered in soot and mud, you know what you would do. You’d quickly rub your hands against your pants or shirt and wipe away the obvious dirt. Then you’d hold out your hands. That’s what makes us children of God. We’d do what we could with what we have to help an innocent child. We know that “cleanliness” in such cases really doesn’t matter. For even if the circumstances were “perfect” we’d still have that uneasy feeling. That feeling that we’re not worthy to hold such innocence, to be entrusted with such treasure. It’s a holy hesitancy that only true humility can bear. Yet, it’s the necessity to help, the clear need for our assistance—the abundantly clear reality that we’re the only “hands” on deck—that drives us to overcome such holy and righteous fear—a fear that reveals just how poor we really are, much poorer in fact than even the helpless child we are about to embrace. It is preciously this beautiful fear of God that propels us to love boldly—to boldly reach out beyond ourselves, to boldly become part of God’s mystical body, to become His very arms and hands—to embody Divine Love Itself—that perfect love of the eternal Father for each and every child ever created. For it is the Father’s love that creates us, and sustains us, and longs to flow through us. We just sometimes need extreme circumstances—ridiculously obvious situations—in order to tap the needed courage to let it to flow beyond our own borders and into those around us. You are in such a situation. Right now. No matter where you are or what you’re doing. Such a situation is at hand. A child, a new born—cold, hungry, and without a home—desperately needs to be held. Quick then, wipe your dirty hands, make due with what you’ve got—believe the Word of God, it’s good enough—now hold out your hands. You’re clean enough to care. This entry was posted in art, contemplation, Inspiration, Motivational, philosophy, poetry, Religion, spirituality and tagged beauty, Catholic, Christ, Christian, Christianity, faith, hope, Howard Hain, Jesus, joy, life, love, peace, poetry, prayer, truth on November 24, 2017 by vhoagland. This Wednesday’s Gospel (Lk 19: 11-28) gives Luke’s version of last Sunday’s Gospel from Matthew (Mt 21:14-30). Luke introduces another parable within the main one. This nobleman is rejected and despised by his own people. Jesus was already “near Jerusalem”, so His Passion was certainly on His mind. Since this Gospel was probably written after the destruction of Jerusalem, we are given a reference to the “slaying” of so many of Jesus’ “fellow citizens”. But let me return to the main message of this parable in both Luke and Matthew. The master entrusts ten servants with a gold coin each. The first two servants seem to obediently invest their coins and make a good profit. The master is very pleased and rewards them with even greater responsibility! One possible interpretation of this parable is the immeasurable value of God’s gift of faith in Him ( the gold coin). We are called to share this faith so that this treasure will also live in others’ hearts. The more we do, the more Jesus expects us to accomplish for His Kingdom. In Matthew’s parable the good servants are also rewarded by the invitation to “come, share your master’s joy.” There is so much joy in the service of God, even when we are called to do difficult things. Perhaps we can also look at this gold coin as the gift of Jesus Himself. coin-shaped Host. I hardly had any time to relish this gift as I had to go down to the aisle, being very careful not to trip off one of the steps and drop the golden patten, full of treasure, which I gingerly carried in my hands. The Body of Christ, His beautiful people, came one after the other. The priceless treasure that I would give each one of them filled me with luminous ecstasy. To hold Him in my hands! To worship Him each time I looked at Him and said “Body of Christ!” I truly felt like the good servant. I shared in His Joy. Thank You, Beloved ! Do I sound just a little like the Pharisee at the temple? What about the tax collector who comes with nothing to offer, except his fear and hope? What about the “wicked, lazy servant,” who took this golden coin, this gift of faith, and wrapped it in a handkerchief and hid it underground, or put it in some forgotten drawer, then saying to God, “I was afraid of you, because you are a demanding man; you take up what you did not lay down and you harvest what you did not plant.”? He cringes before God, as the punitive, exploitative dictator of our lives. I know so many good people who feel like this, even though they were once worshipers of Jesus. The many bad breaks in their lives have led them to believe that God has it in for them. Their sinfulness has made them feel unworthy of salvation . The harsh Bible readings (like this one! ), sermons, admonitions, and unfortunate rejections by our Church have led them to let go of that precious coin that was given to them. Beloved, You are Mercy itself. I trust in Your infinite Love. “ If we don’t look upon God as a hard man we have every reason to congratulate ourselves. We say we think Him merciful, kind, loving, but in our hearts look upon Him as hard. Three-quarters of the troubles of good people come from this. He feels intensely our misconception of Him. We look upon Him as a hard grasping man, who wants to get all He can out of us and give nothing in return. And woe betide us if we fail to satisfy Him. This is utterly wrong. The golden coin He gave is of course, His Love. This is a forever gift. This entry was posted in contemplation, Inspiration, Motivational on November 22, 2017 by vhoagland. What I do know leads me up the ladder of not understanding. To my perch upon the Cross. Within the heart of my child Jesus. Museum Wall Card for Work Above, from: Michelangelo: Divine Draftsman and Designer, on view at The Met Fifth Avenue from November 13, 2017 through February 12, 2018. This entry was posted in art, contemplation, Inspiration, philosophy, poetry, Religion, spirituality and tagged beauty, Catholic, Christ, Christian, Christianity, Cross, faith, hope, Howard Hain, Jesus, joy, life, love, Michelangelo, peace, poetry, prayer, silence, truth, work on November 21, 2017 by vhoagland. As chief-tax collector, Zacchaeus was an agent for Herod Antipas, ruler of Galilee and Perea in Jesus’ day. As archeologists uncover the ruins of Herod’s building projects in Galilee and elsewhere, it’s evident he built on a grand scale and lavishly, to impress his allies the Romans. And so the tax collectors went out and got the money, keeping some for themselves. You needed to be tough and relentless for the job. It left you hard headed and hard hearted. An unsavory profession. People resented them. 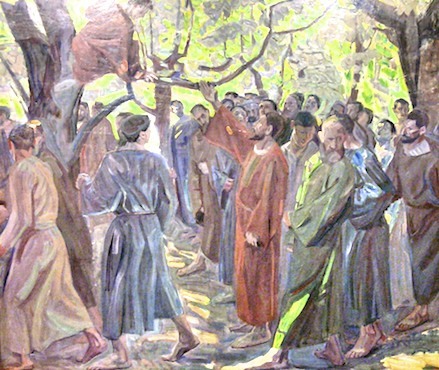 Zacchaeus, the chief tax collector in Jericho, was the one whom Jesus called and the one he stayed with on his way to Jerusalem. The only thing Jesus says is: “Today salvation has come to this house because this man too is a descendant of Abraham. For the Son of Man has come to seek and to save what was lost.” No thunderous warnings or stern corrections. Salvation has come and they sit down for a feast. You can hear in the story echoes of the Parable of the Prodigal Son, also from Luke’s gospel. Notice, too, that Jesus doesn’t call Zacchaeus to follow him, as he told another tax-collector, Matthew. He doesn’t tell him to give up his job and get out of that dirty, complicated situation. No, as far as we can tell Zacchaeus was still chief tax-collector in Jericho after Jesus left, still taking orders from Herod Antipas, still part of a sinful world. But that’s where Zacchaeus will experience salvation, even there. God’s mercy works in the real world and in real life. This entry was posted in Religion and tagged Herod Antiphas, mercy, Passionists, St. Luke's gospel, tax collectors, Zacchaeus on November 20, 2017 by vhoagland. jedode1 on Where Did They Stay?